As the Brett Cavanaugh controversy rages on, overlooked is a news item about the tent city set up for the migrant children in Tornillo, Texas. According to the New York Times, in the past few weeks around 1,600 children were rounded up from detention centers and foster homes to be moved into this new version of a concentration camp. The relocations usually occurred at midnight without warning. 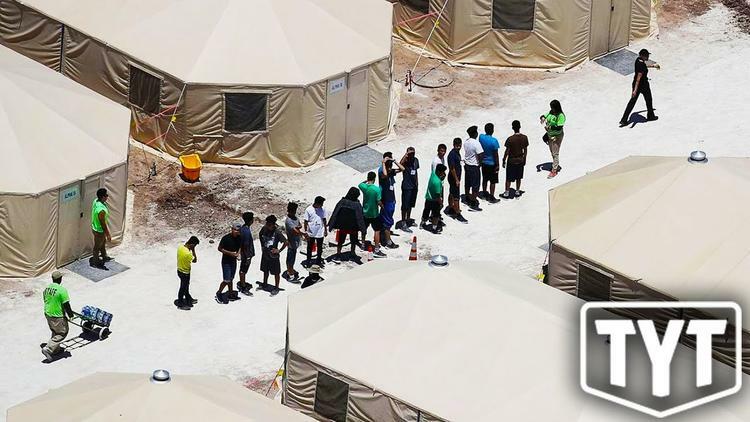 Could this tent city develop into a new concentration camp? Reviewing the history of concentration camps can be instructive for us as we consider the detainment of migrants on the U.S.-Mexican border. “Concentration camps” are not necessarily death camps but relocation centers for civilians. Although many people may assume that the Nazis had conceived the concept of concentration camps, it first emerged from U.S. aggression in both Cuba and the Philippines. Butcher Weyler, the commander in Cuba during the Spanish-American War, felt the need to separate the guerrillas from the villagers. He set up “reconcentration” camps in 1896 that left 100,000 dead. During the Philippine-American War, the U.S also set up camps in 1899 to house almost 300,000 civilians. U.S. soldiers would shoot on sight any Filipino outside the camps. In the “zone of death,” the soldiers burned down houses in a scorched-earth policy. One reporter described the prisoners as “a miserable-looking lot of little brown rats … utterly spiritless.” The civilian death toll from the camps or the entire war is impossible to determine. The most notorious example of a pre-World War II concentration camp, the British imprisonment of the Boers in South Africa, began in 1900. Like the U.S. military, the British were frustrated by the civilians helping the guerrillas. The British decided to house the “undesirables” (mostly women and children) in tent camps to motivate the Boer men to surrender. A British social worker, Emily Hobhouse, visited these camps and wrote a damning report: “Numbers crowded into small tents: some sick, some dying, occasionally a dead one among them; scanty rations dealt out raw…” In response to her criticism, the daughter of a British general wrote about “the hysterical whining going on in England” while “we feed and pamper people who had not even the grace to say thank you for the care bestowed on them.” Almost a quarter of the camp’s inhabitants died from 1900-1902. In the end, almost 28,000 Boers died in these camps—most of them children. One key difference between these three examples of camps and the current crisis is that we are not at war with Mexico or any other home countries of the migrants. Although using concentration camps during wartime was morally reprehensible, at least there was a logical reason for them. The U.S. government, though, is not reacting to any immediate threat. Even if some of these migrants were drug criminals or rapists (a label promoted by Trump), law enforcement could contain this threat. The new concentration camps are simply not necessary for protecting the U.S.-Mexican border. Another aspect of these camps is the demonization of the imprisoned populations. During wartime, it is common to consider the enemy population as subhuman—especially if they are persons of color such as the Cubans and Filipinos. Racism, then, can influence our attitudes toward those living behind chain link fences. On the White House website is this article: “What You Need To Know About The Violent Animals Of MS-13.” Yes, the MS-13 gang can be extremely violent but the idea of a government website calling them “animals” is disturbing. For too many people, the characterization of all Latinos as gang members justifies the current immigration policy. The last point is that I used the word “migrant” deliberately because it encompasses three categories: immigrants, asylees, and refugees. How many of these imprisoned children (and the adults in other facilities) are seeking asylum under international law? People call these migrants “illegal immigrants” as automatically as the British calling the Boers “the undesirables.” However, many of these migrants were not necessarily moving up north for better opportunities but escaping from drug or state violence. These migrants were fleeing for their lives as urgently as did the evacuees fleeing Florence or other hurricanes. No matter the motivation for their migration, these folks deserve our respect as fellow humans. The ideology of considering them as “undesirables” is antithetical to common decency. Despite the grim shadows of Butcher Weyler and others who darken the pages of U.S. history books, we can overcome the past. We can find a compassionate alternative to the current policy of mass detentions. We can—and must–do better.